Tycho Brahe lived with a hand-crafted nose made of brass after his real one was sliced off in a duel. Mr. Brahe was a renowned 16th-century Danish astronomer and a great empirical scientist whose data were used to formulate Johannes Kepler’s three laws of planetary motion. But for our purposes, Tycho Brahe is especially interesting for something other than his prosthetic schnoz or his contributions to astronomy, but for a notable mistake. Confronted with his own irrefutable evidence that the known planets of his day (Mercury, Venus, Mars, Jupiter, and Saturn) revolved around the Sun, Brahe was nonetheless committed to the prevailing biblical view of a geocentric universe. So he devised an ingenious model in which those planets indeed revolved around the Sun … but with the resulting conglomeration obediently circling a central and immobile Earth! Modern versions of Brahe’s Blunder abound, in which people accept – begrudgingly – what is forced upon them, whilst desperately clinging to their pre-existing beliefs: what they want to be true. It’s a version of denial in which the truth isn’t so much rejected outright as finessed, leaving the individual with a version of reality that feels satisfying but falls short of accuracy. Recent prominent cases include granting that the Earth’s climate is heating up (the data are as clear as that confirming planetary orbits), but refusing to accept that human beings are responsible, or agreeing that evolution is real (when it comes to microbial antibiotic resistance, for example) but denying that it produced human beings. A good paradigm is a tough thing to lose. This, in turn, may contribute to what appears to be a “war on science” these days, manifested most notably by a triad of resistances: to evolution, to human-caused climate change, and to medical vaccinations. There are doubtless many reasons for this unfortunate situation, including religious fundamentalism (evolution), economic interest on the part of fossil fuel companies and their minions (global warming), and misinformation deriving at least in part from a wholly discredited but nonetheless influential medical report (vaccinations). Of course, other factors are also at work, but an especially important contributor to this anti-science epidemic – and one that hasn’t received the attention it warrants – is the simple fact that scientific “wisdom” isn’t static, combined with the widespread public reluctance to modify an opinion once established. Just consider how much easier it is to change your clothes than to change your mind. Most people aren’t as inventive as Tycho Brahe, and so reversals of scientific consensus have left many people feeling jerked around, and thus, confused and increasingly resistant to the whole enterprise. This resistance is all the stronger when new paradigms reduce our status, as happened when the Earth was demoted from the center of the universe to a small planet orbiting an insignificant star in the corner of a relatively minor galaxy. Much of the power of science derives, paradoxically, from the fact that – unlike opinion, whether public or private – it is open to dramatic changes if the evidence so demands. Scientific paradigms are constantly tested and revised, which in turns leads to the false impression that science itself is somehow unreliable. Most people, in short, have a hard time dealing with the accumulating debris of scientific paradigms lost – to the extent that confidence in science itself has become a victim. Ultimately, however, science is uniquely and profoundly reliable; indeed it offers our most dependable insights into the nature of the real world and of ourselves (allowing, of course, for the malleability of its wisdom… which is a crucial part of that wisdom). In the past, the death of certain paradigms has been largely metabolized by the informed but non-professional public. Thus, most citizens don’t have much difficulty – at least these days – replacing the Ptolemaic, earth-centered system with its Copernican, sun-centered version, or superseding Newtonian physics by Einsteinian relativity and quantum mechanics (so long as they aren’t asked to explain the latter two! ), or even recognizing, with Freud, that much of human mental life occurs in our unconscious. There have been many more highly specific but nonetheless consequential tremors in the received wisdom of biological science that now constitute paradigms lost. For example, we know that not all “germs” are bad (many – perhaps the majority – are necessary for a healthy life), that contrary to earlier dogma, many neurons are capable of regenerating, cellular differentiation isn’t necessarily a one-way street (“Hello, Dolly!”), seemingly “altruistic” behavior arises as a result of natural selection and thus isn’t evidence for divine intervention and although individual lives are fragile, life itself is remarkably robust (living organisms have been found in some of the bleakest, most toxic and extreme environments). Milton’s great poem, intended to “justify the ways of God to men,” described the consequences of Adam and Eve disobeying God and eating fruit from the Tree of Knowledge of Good and Evil. Ours is a lesser punishment: loss of paradigms instead of paradise. But in the end, what justifies science to men and women is something more valuable and, yes, even more, poetic than Milton’s masterpiece: the opportunity to consume the fruits of our own continually re-evaluated, deeply rooted, profoundly nourishing Tree of Scientific Knowledge. And to do so without committing Brahe’s blunder. To do so, however, we need to know that in science, a paradigm lost is merely another phrase for wisdom gained and that in the process we can see the world and ourselves through a glass brightly, and not at all darkly. Featured image credit: “light-bulb-glow-lighting” by Aritio. CC0 via Pixabay. 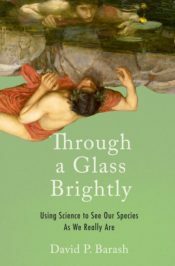 David P. Barash is an evolutionary biologist and professor of psychology emeritus at the University of Washington; his most recent book is Through a Glass Brightly: using science to see our species as we really are (Oxford University Press).